Turbo compounding is the process of using the energy from the exhaust with the help of a turbine and restore back into the system. It is used to provide additional power to the crankshaft, power generator as they transfer the energy to the whole system. It is a method of extracting additional power from the system and using it in the system again. It is used to increase the efficiency of the system and increases the power output of the gas and diesel engines. It controls and reduces the emissions of various harmful gases from the system. The various application of turbo includes heavy vehicle engines, compounding motorsport, aircraft engines and racing engines. There are two types of turbo compounding system such as electrical turbo compounding systems and mechanical turbo compounding systems. In mechanical turbo compounding systems, the waste energy from exhaust is transformed into kinetic energy and is transmitted back into system. On the other hand in electrical turbo compounding systems, the waste energy from exhaust is electrically transmitted through electronic module. 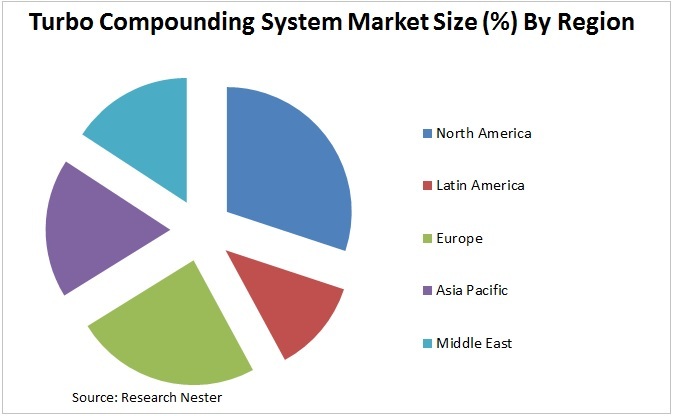 By region, global turbo compounding system market is segmented into North America, Asia-Pacific, Latin America, Europe, Middle East and Africa. North America is anticipated to lead the global turbo compounding system market on the account of high technological adoption rate in the region. Asia-Pacific region is fastest developing region throughout the forecast period. The high usage of this system in power generation is anticipated to increase the market growth of the turbo compounding system during the forecast period. The rising environmental concern to reduce the carbon di-oxide content in the atmosphere is a major growth driver for the global turbo compounding system market during the forecast period. The strict government regulation pertaining to emission control is anticipated to fuel the demand for the turbo compounding system .The increasing demand for the efficient technology solution is also driving the global turbo compounding system market. The increasing use of turbo compounding systems in the passenger and commercial vehicle in order to use the energy from the waste is also a major growth driver for the global turbo compounding system market. However, high cost associated with the turbo compounding system is a major restrain for the global turbo compounding system market. Additionally turbo compounding system is used in limited cars. Thus, restricted use of turbo compounding system may act as restrain for the global turbo compounding system market.